The Otro Diseño Foundation is pleased to announce its alliance with the organizations NovaJoia, from Brazil and Walka Studio, from Chile. This alliance has specifically been brought together to promote the broadening, development, understanding and appreciation of contemporary jewellery as a medium of cultural expression from and within Latin American and the Caribbean and to stimulate its engagement into international dialogue. Our goal is to generate opportunities for jewelers and artists from Latin America to explore the creative and communicative potential of jewellery and for a broader audience to become acquainted with the contemporary jewelry practices of the continent. THINK. The creation of Laboratorio de Ideas, a PanAmerican, multidisciplinary think thank which stimulates the vigorous and creative analysis and theorizing of contemporary jewellery. Through Laboratorio de Ideas we aim to assert the character of Latin American jewellery by seeking out ways to transform and alter existing notions about the region, while presenting competing ideas about what constitutes its particular sensibility and, at the same time, further develop its ability to communicate globally. LEARN. The implementation of Taller Viajero, a comprehensive educational program based in a more liberal understanding of jewellery and consisting of a series of nine different workshops, each of which will travel to the different regions of Latin America. Taller Viajero aims will provide jewellery makers from Latin America a challenging environment that encourages unorthodox thinking and experimentation and enables them to assert a powerful personal language while developing a consistent and professionally executed body of work. The program is open to jewellery artists residing in Latin America interested in developing the concept of jewellery as a form of artistic expression and wishing to perform in a global environment. DISSEMINATE. The development of an exhibition program which will produce at least three exhibitions, conceived with the highest standards of scholarship, display, and interaction with the public and which show the work of professional and emergent contemporary jewellery makers from Latin America. These exhibitions aim to create provide the regional audience the opportunity to become familiar with the concept of contemporary jewellery and to an international audience with the cultural framework to understand the jewellery practices from the continent. 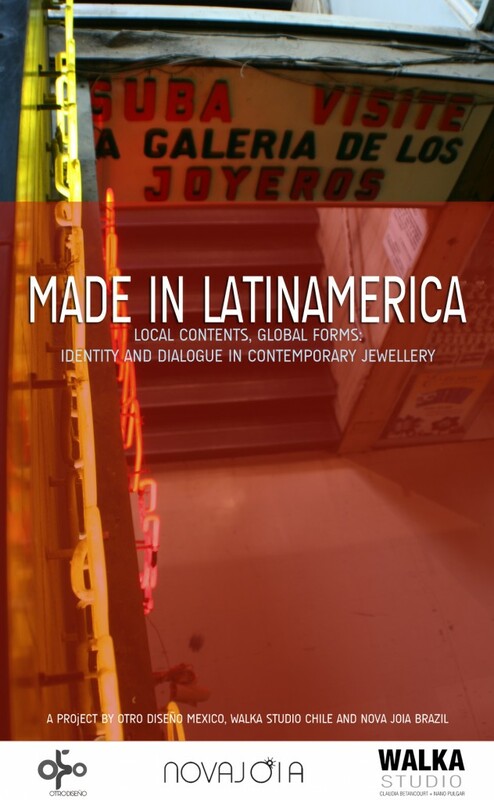 Made in Latin America will be launched in September 2012 within the frame of the first workshop of the series: The Political Body, by American jewellery artist Shari Pierce.